Book Review: I am the Messenger by Markus Zusak | What Does Mel Think? 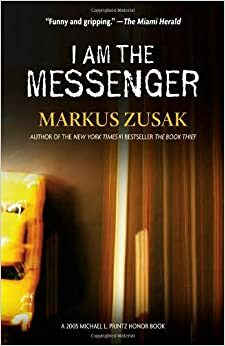 Today I have a book review for you, as you may know I adored 'The Book Thief' by Markus Zusak and 'I am the Messenger' has been on my TBR for a very very long time. I finally got round to reading it after living in fear that it would not quite match up to my one and only. The general gist of the story is that average, card playing cab driver Ed Kennedy's life gets turned upside down when he successfully stops a bank robbery and starts receiving playing cards in the post which set him challenges to help the lives of others in the town. Along the way he learns a lot about not only the people he helps but about himself too. Ed is very loveable just as the characters in 'The Book Thief' were, and the stories of the people he helped really touch your heart. Each character has so much depth, at first I hated Ed's friends and his Mum but as the story goes on you learn why they are that way. It teaches you that everyone has their own fight going on whether you can see it or not. To be honest I really didn't like Audrey, Ed deserves someone waaay better who actually cares about him and doesn't leave him dangling as she does through the entire plot. Yes she does have more depth to her but I despise female characters whose lives revolve around which man they're going to be with next. Overall the book was really enjoyable: a nice easy read but with a lot to learn. I would recommend it if only to restore your faith in humanity. It is so important to do little things to help out other people. maybe not in the massive way Ed does but just little things to remind other people that they are not alone. Markus Zusak is a very talented writer and although 'The Book Thief' remains my favourite book written by him, this still is worth reading and supplied my demand for more of his gorgeous writing. Have you read anything by Markus Zusak? I want to know what I should read by him next, or if you love his work just as much as I do (or not!). Leave me a comment!